2007 Harley Davidson Screaming Eagle Road King CVO (custom vehicle operation)for sale with Factory Equipment: 110 cu inch engine, Six speed transmission, Custom Chrome Wheels (18" Front-17" Rear), Wide Rear Fender with Tombstone Tailight, Black Ice Paint with Pewter Flames graphics outlined in light blue, Custom Leather motorcycle seat with matching hard leather saddlebags. Matching Custom Chrome and Rubber handgrips, floor boards, shifter pegs, brake pedal pad-passenger foot pegs, metal combination speedometer,tachometer and much more. Added parts and accessories on the Harley Screamin Eagle are a set of Rhinehart True Dual pipes, a power commander and a louder horn. 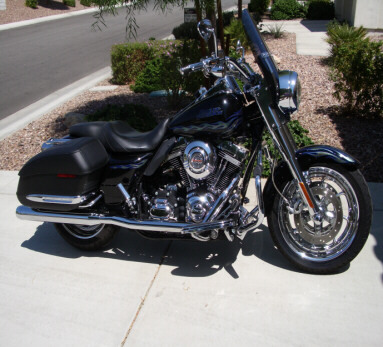 2008 was last year for the CVO Harley Davidson Screaming Eagle Road King. Mine has only 17K miles and the listed Kelly Blue Book Value is $27,120. I'm asking $22,000. Call 760-360-1260 or E-Mail matbellina "at" aol.com.